John Barros, chief of economic development for Boston, spoke during a hearing on the city&apos;s licensing process for marijuana businesses. Responding to mounting criticism of Boston’s system for licensing marijuana businesses, a top official in the mayor’s administration said Tuesday that the city should consider approving equal numbers of larger investor-backed cannabis firms and those owned by local residents, people of color, and women. 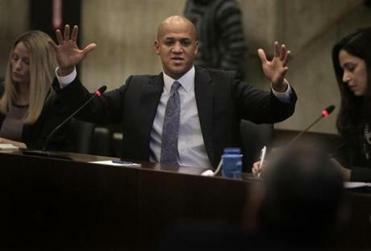 The unexpected pronouncement by Martin J. Walsh’s economic development chief, John Barros, came during a four-hour hearing at which Boston city councilors sharply questioned Walsh officials over their handling of the rollout of recreational pot sales in the city. It appeared to mark a new willingness by the mayor’s office to make major changes to its much maligned process for selecting prospective marijuana operators. Councilors and small marijuana business owners testified Tuesday that the city’s current licensing process is slow, complex, and opaque, favoring wealthy — and white — operators who can afford to sit on prime properties and hire well-connected consultants and former officials to grease the wheels. Citing the historic racially disproportionate enforcement of drug laws and growing income inequality, they pushed Walsh’s representatives to do more to ensure the city’s marijuana industry isn’t dominated by the already privileged. Several councilors referenced Boston’s uphill struggle to diversify ownership of alcohol licenses in the city, saying cannabis presented a unique opportunity to get things right and include frequently marginalized groups from the start. 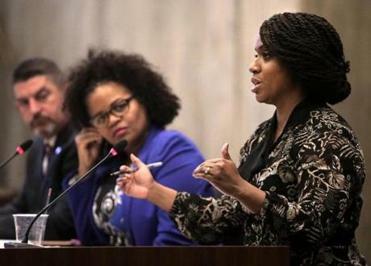 Boston, MA - 12/04/18 - City Councilor and Congresswoman-elect Ayanna Pressley spoke during the meeting. 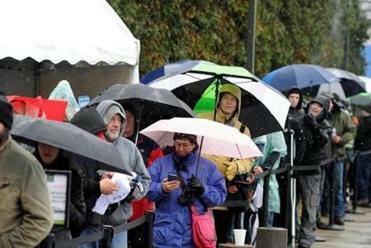 So far, just two medical dispensaries have opened in Boston, and no recreational shops. Walsh, who opposed the ballot measure to legalize recreational pot sales, has said the city’s first cannabis retailer could open early in 2019. Barros said the mayor’s office, which has authority over local licensing, could encourage diverse ownership of such businesses by mimicking Somerville’s approach to local marijuana licensing. That city recently passed an ordinance that grants alternating approval to established medical marijuana firms and companies owned by local residents or by state-designated “economic empowerment” companies — those that are either led by, employ, or benefit communities that had high rates of arrests for drug crimes. Under Somerville’s system, existing medical marijuana firms cannot move forward with recreational applications unless an equal number of the economic empowerment or locally owned companies have also been approved. “I think a one-for-one [ratio] should be considered” in Boston, Barros said. He said doing so would allow a more diverse set of applicants to “run and catch up,” even if it means slowing down larger operators. However, Shaleen Title of the state Cannabis Control Commission rebutted the idea that Boston faces a choice between moving quickly and ensuring its industry is equitable, noting in her testimony that economic empowerment applicants jump to the front of the line in the state licensing process. Of the more than 50 companies that have started Boston’s four-stage licensing process, just one economic empowerment applicant has made it to the second step. Boston is hardly alone in its struggles, however — none of the 76 provisional licenses awarded by the state commission have gone to minority-led marijuana companies. The commission to date has received 192 complete applications from 100 companies. Nonetheless, as Tuesday’s hearing approached and the chorus of complaints grew louder in recent weeks, Walsh’s administration has scrambled to play catch-up. 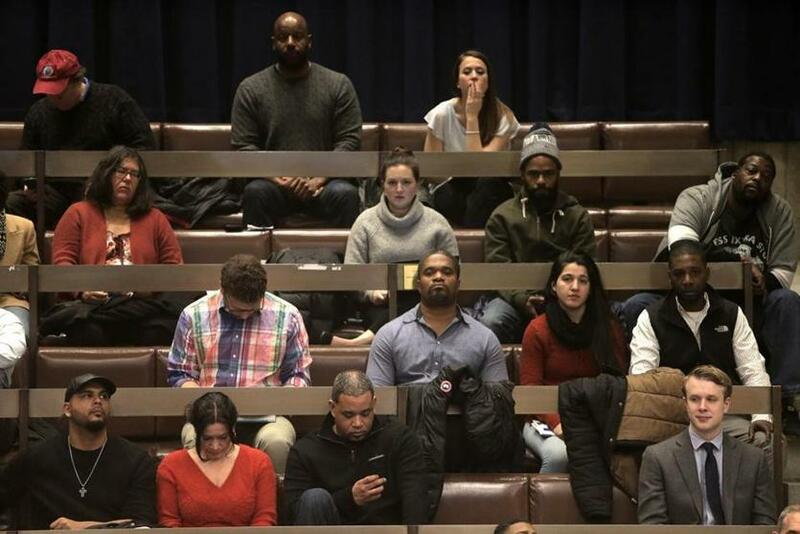 Alexis Tkachuk , the director and only employee of the city’s Office of Emerging Industries, which handles marijuana applications, said at the hearing that Boston will now require pot companies to submit diversity and inclusion plans as part of their local applications. She also pledged that the city would soon begin asking new applicants whether they hold economic empowerment status at the state level, after city councilors expressed disbelief that the current application does not already include that question. Tkachuk and Barros said diversity figured in their selection of Ascend Cannabis over two competing ventures in the same neighborhood as the first marijuana retailer to sign a host community agreement with Boston; that company’s chief executive is former Suffolk County sheriff Andrea Cabral, who is black. However, the firm is owned and financed by wealthy venture capitalist Abner Kurtin. Barros said the federal prohibition on marijuana has been a major obstacle to equity, since it prevents banks from loaning money to cannabis firms — and because most of the city’s small business assistance efforts are funded by federal dollars that cannot go toward pot companies. The Walsh administration is already trying on an informal basis to connect smaller players to sources of funding, according to Barros. But he said the City Council should work with Walsh’s office to create a dedicated pool of money in the next budget cycle for assisting smaller operators in the struggle to find suitable properties and navigate the application process — perhaps funded by the city’s 3 percent tax on retail pot sales or the 3-percent-of-revenue fee it charges under its host community agreements with cannabis operators. “We should be asking the [nonminority] businesses that start up in Boston to contribute to a fund that helps to strengthen our ability to support local minority- and women-owned entrepreneurs,” Barros said at the hearing. But city councilors, including Janey, Andrea Campbell, and Lydia Edwards, questioned why Walsh’s office was only turning its attention to the issue now. Campbell and other councilors said they had received complaints from applicants who couldn’t reach Tkachuk with questions, were struggling to navigate the politics of winning neighborhood support at required community hearings, and complained about their inability to know where other marijuana companies were trying to open — critical information, since Boston imposes a half-mile buffer between all licensed pot firms. They called on the Walsh administration to offer better guidance to pot firms, cut red tape, and consider imposing a residency requirement to beat back a rush of out-of-state operators. Dan Adams can be reached at daniel.adams@globe.com. Follow him on Twitter @Dan_Adams86.